The Town of Champlain has always been a major industrial hub in Clinton County. In its first 100 years since it was founded by Pliny Moore in 1788, the Great Chazy River and Corbeau Creek powered dozens of sawmills, grist mills and flax mills. Between the 1820s and 1840s, the roots of the iron industry were planted. At the same time, boat building commenced along the Great Chazy River. The most enduring industry in Champlain was the foundry business. Two iron foundries were established in the Village of Champlain - the Champlain Agricultural Works in 1820 and a small iron foundry in 1840 that eventually evolved into the Sheridan Iron Works/Harris Graphics after many ownership and name changes. 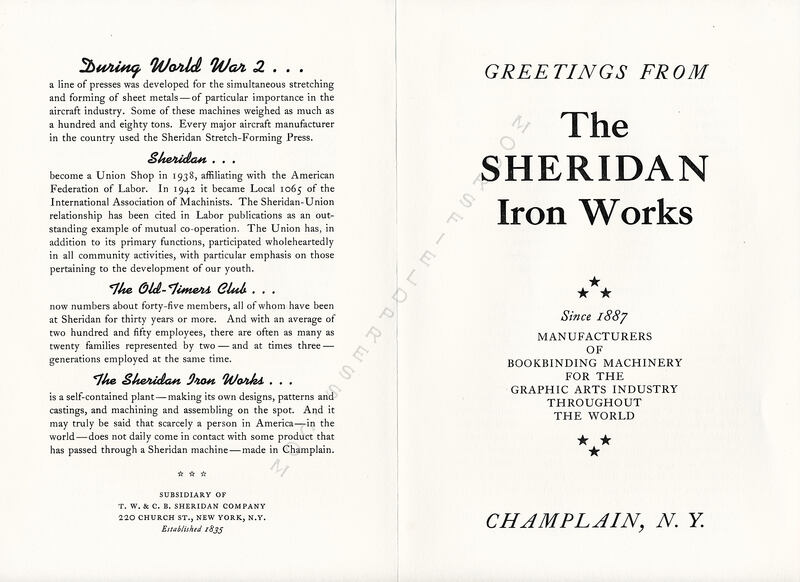 The Champlain Agricultural Works was in existence for about 90 years and the foundry that became Sheridan was in existence for almost 150 years. Very few companies in the United States today can claim a 150 year existence. This is the story of Champlain’s enduring foundry businesses. See the Champlain Historic Calendar for a complete history of the iron industry in Champlain including the Sheridan Iron Works. In 1788 . . .
Pliny Moore and five other bold spirits arrived in what is now the Village of Champlain to establish homes for themselves in the virgin wilderness. Their first community project was the building of a sawmill near the site of the present water-works. A grist-mill soon followed, and later a fulling-mill—thus was Industry established in Champlain. The Iron Age . . .
came to Champlain in 1820. In that year Solomon Bostwick, the local cabinet and furniture maker, listed "Wood Patterns for Castings" among his items. These were used by the Champlain Agricultural Works, established in the same year; their products included plows of various types, mowers, tedders and rakes, churns, corn shellers, and other farm equipment. This latter concern continued operations as late as the 1900's. A Second Foundry . . .
was established in 1840 by Thomas Whiteside on the corner of Main and Cedar Streets. In 1847 it was leased to David Finley and James S. Smith. The following year the machine shop connected with it burned down, but was soon rebuilt and the business continued there for six years. Finley and Smith . . .
in 1854 built a new foundry on the site of the present Sheridan Iron Works. It consisted of a two-story brick machine shop, 40 x 80, and a brick foundry building, 40 x 100, containing two cupolas—both structures still in use today. They made steam engines and boilers, circular saw mills, iron water wheels, brass and iron castings, stoves and pumps—also car wheels for the Northern (now Rutland) Railroad. 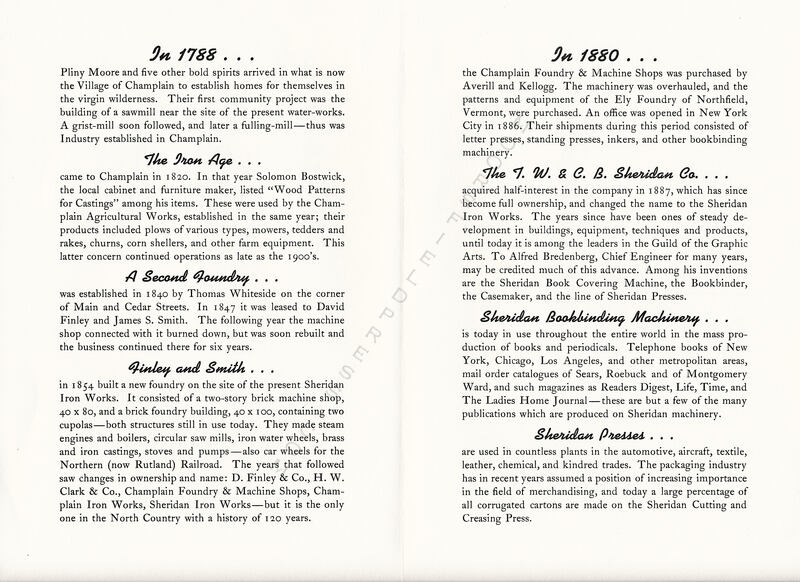 The years that followed saw changes in ownership and name: D. Finley & Co., H. W. Clark & Co., Champlain Foundry & Machine Shops, Champlain Iron Works, Sheridan Iron Works—but it is the only one in the North Country with a history of 120 years. In 1880 . . .
the Champlain Foundry & Machine Shops was purchased by Averill and Kellogg. The machinery was overhauled, and the patterns and equipment of the Ely Foundry of Northfield, Vermont, were purchased. An office was opened in New York City in 1886. Their shipments during this period consisted of letter presses, standing presses, inkers, and other bookbinding machinery. The T.W. and C.B. Sheridan Co. . . .
acquired half-interest in the company in 1887, which has since become full ownership, and changed the name to the Sheridan Iron Works. The years since have been ones of steady development in buildings, equipment, techniques and products, until today it is among the leaders in the Guild of the Graphic Arts. To Alfred Bredenberg, Chief Engineer for many years, may be credited much of this advance. Among his inventions are the Sheridan Book Covering Machine, the Bookbinder, the Casemaker, and the line of Sheridan Presses. Sheridan Bookbinding Machinery . . .
is today in use throughout the entire world in the mass production of books and periodicals. Telephone books of New York, Chicago, Los Angeles, and other metropolitan areas, mail order catalogues of Sears, Roebuck and of Montgomery Ward, and such magazines as Readers Digest, Life, Time, and The Ladies Home Journal—these are but a few of the many publications which are produced on Sheridan machinery. Sheridan Presses . . .
are used in countless plants in the automotive, aircraft, textile, leather, chemical, and kindred trades. The packaging industry has in recent years assumed a position of increasing importance in the field of merchandising, and today a large percentage of all corrugated cartons are made on the Sheridan Cutting and Creasing Press. During World War 2 . . .
a line of presses was developed for the simultaneous stretching and forming of sheet metals—of particular importance in the aircraft industry. Some of these machines weighed as much as a hundred and eighty tons. Every major aircraft manufacturer in the country used the Sheridan Stretch-Forming Press. became a Union Shop in 1938, affiliating with the American Federation of Labor. In 1942 it became Local 1065 of the International Association of Machinists. The Sheridan-Union relationship has been cited in Labor publications as an outstanding example of mutual co-operation. The Union has, in addition to its primary functions, participated wholeheartedly in all community activities, with particular emphasis on those pertaining to the development of our youth. The Old-Timers Club . . .
now numbers about forty-five members, all of whom have been at Sheridan for thirty years or more. And with an average of two hundred and fifty employees, there are often as many as twenty families represented by two — and at times three —generations employed at the same time. The Sheridan Iron Works . . .
is a self-contained plant—making its own designs, patterns and castings, and machining and assembling on the spot. And it may truly be said that scarcely a person in America—in the world—does not daily come in contact with some product that has passed through a Sheridan machine—made in Champlain. 220 CHURCH ST., NEW YORK, N.Y.